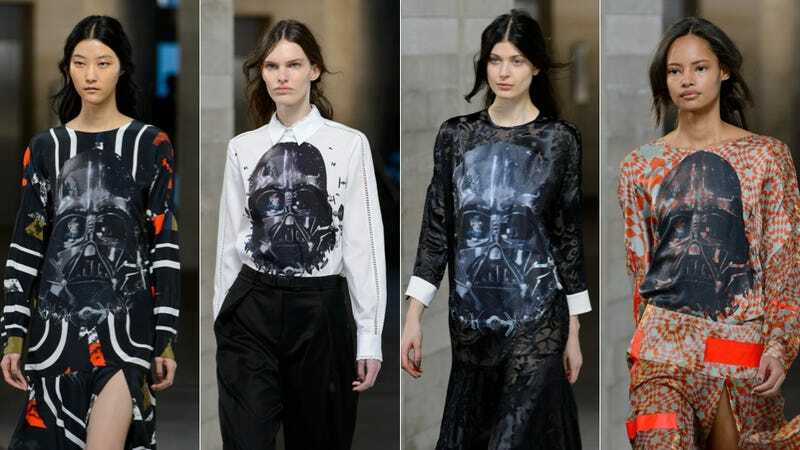 Um, well, this is a weird coincidence: following Rodarte's Star Wars-themed collection, which debuted last week in New York, edgy British fashion house Preen has also unveiled a Star Wars line (during London Fashion Week). What are the odds? According to Elle, the duo behind the line was just as surprised as we are to see two separate Star Wars collections this season: "Obviously we were shocked when it happened, because nobody told us, but we just thought that it was too late to change the collection," Preen designer Thea Bregazzi said. "We've got Darth. We've got the Dark Side." Like Rodarte's Laura and Kate Mulleavy, Bregazzi and her partner Justin Thornton incorporated their influence quite literally into some garments: behold, dresses and a button-up bearing screen-printed images of Darth Vader's mask. But Star Wars infiltrated the collection in more subtle ways as well: in oversize, helmet-esque fur hats and metallic foil outerwear, which Bregazzi says was inspired by the massive parkas sported by fans waiting outside theaters for the movie's 1977 release.